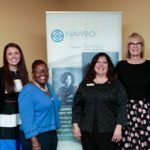 NAWBO-Indianapolis strengthens and supports its members through networking and educational events. NAWBO-Indianapolis hosts many events throughout the year—both exclusive to members and non-exclusive. Our events are the perfect opportunities to not only learn about current topics affecting businesses of all sizes, but to network with some of Indianapolis’ most powerful women. The popularity of our Luncheon Meetings is evident by the growth in attendance over the past two years. In fact, we have had to change venues twice in just the last two years to accommodate our growth! Our panel discussion, Trailblazers, held annually in the spring, is becoming more popular and not just with our members and partners. Many non-members and students attend as well. After listening to prominent businesswomen discuss how they blazed their trail to success, you can’t help but leave feeling empowered, inspired and educated. Our Visionary Awards Luncheon, is the premier NAWBO-Indianapolis event. Established in December 2004, this event’s purpose is to honor our members, local businesswomen and women business supporters with our Visionary Awards. Since 2004, we are honored to say that attendance has increased steadily on a yearly basis! In addition, NAWBO-Indy members and Corporate Partner have the opportunity to attend our FREE MEMBERS-ONLY EVENTS! The attendance at our invite-only Connections has reached its maximum the past three years. Some of the top decision makers in the city and state attend this cocktail reception, along with our members and Corporate Partners. As a direct result of our members’ needs, the Circle for Learning & Networking was established. In the overwhelming response to our member survey, these small, intimate gatherings were developed with specific goals, including helping connect our members and Corporate Partners. We welcome you to join us at our next event, but by becoming a member or corporate partner, you will have even more opportunities to connect to the right person to match your needs to help grow your business!